"I can confirm this practice has worked with AJ Cook Builders for over five years during which time we have always been impressed with the firm's professional, reliable approach to the service they provide - an excellent standard of workmanship and in our experience achieve good customer satisfaction. We would be more than happy to recommend them to any other professional consultant or private client"
"Over a period of many years, AJ Cook Building Contractors, have carried out a variety of projects and those that I have been involved with are challenging domestic works requiring good management through to efficiency and quality of building work on site. I fully recommend AJ Cook for these reasons." "As a designer of buildings I have worked with A.J.Cook Builders for more than 11 years on projects ranging from approximately £20k to in excess of £525k. The works included some listed buildings. The projects have been executed in a good and workman like way to the satisfaction of the clients and myself with good delivery times. We have always worked harmoniously together." "We should like to record how pleased we are with our new extension, and with the standard of work carried our by A.J. Cook - which was done with the minimum of fuss, no delays (in fact completion was well before the estimated date of 12th September), and in a most courteous and professional manner by all concerned. We would have no hesitation in recommending A.J. Cook to any potential clients you may have, it's been a pleasure doing business with you!" 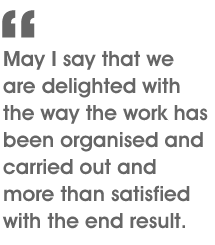 "May I say that we are delighted with the way the work has been organised and carried out and more than satisfied with the end result. Our thanks to you and to all the men who have worked here." "The patience you have both shown has been very much appreciated & we have been totally overawed with the supreme standard of all your craftsmen. We have also been very impressed with your positive attitude to all our ideas and requests. Many people have taken a great interest in the construction of the house - and they are all aware of who has built it! We were very fortunate to have you create our house and it will be a lifelong testament to you and your team."